Today we woke up reeling from the activities that had taken place over the past 24 hours. While we were feeling safer there by the day, Yesterday we had the opportunity to witness a “burn out.” Just before church had stared, everyone was in a panic so we went outside to see an old RV and bushes on fire about a block from us. 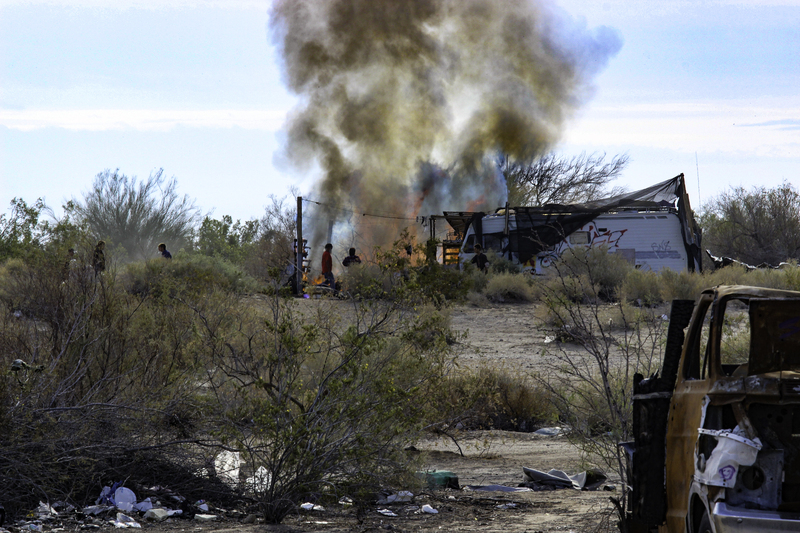 The Niland fire department was there within in minutes. Fortunately the guy living there managed to get out unscathed with his three dogs. Once again, although not really fearful, we had spent the night again thinking about how dangerous the Slabs can be. Today however was a new day and there was a lot of excitement about the arrival of a War Vet Support group who would be setting up for the day. The served breakfast and lunch for the residents, and then had trailers set up to help War Vets file their paper work so they could get benefits that in some cases were years over due. We didn’t attend the dinners, but were really excited when George, a War Vet from Nam came back to see us and share the wonderful news he had just found out! The Vet Association had managed to secure him some back payments so he could use the money to get a better motor home! We were thrilled to hear that. Now if you heard what he actually got you would be chocked! You would think war vets would get more care and more financial assistance than they really do. Lets just say that the amount he would receive is about as much as the average person can make working for 1 month. Sick… Sick …Sick. What a twisted world we live in. For George, however, it was a gift from God! You would have thought he had won the lottery! Of course we celebrated with him and his wife who calls herself Janet From Another Planet. She is a spit fire and a lot of fun to hang out with. We took it easy today, and collected some more videos to share on the blog, and interviewed or took notes of testimonies or stories people from the Slabs wanted to share. Out circle of friends was growing by the day. Even as we sat outside or walked about, people we had never really met and tweekers were waving, saying hello, and thanking us for the BBQ we have thrown for them. We passed out several bags of supplies we had purchased with the gifts we had received, and people were thrilled to have packages of wet wipes, canned food, fruit, granola bars, crackers and cheese, shampoo’s and soap, tooth brushes with paste, and other assorted items. No one asked us for a thing. When we offered them something they were quiet taken back and a friendship started to form. George, who has no money, did say he was looking for a ride into Niland as someone in the slabs needed ice and didn’t have any money. So Doug offered to take them in so he could get it. I think George used his last dollar or two to purchase that. So we followed up on a promise. 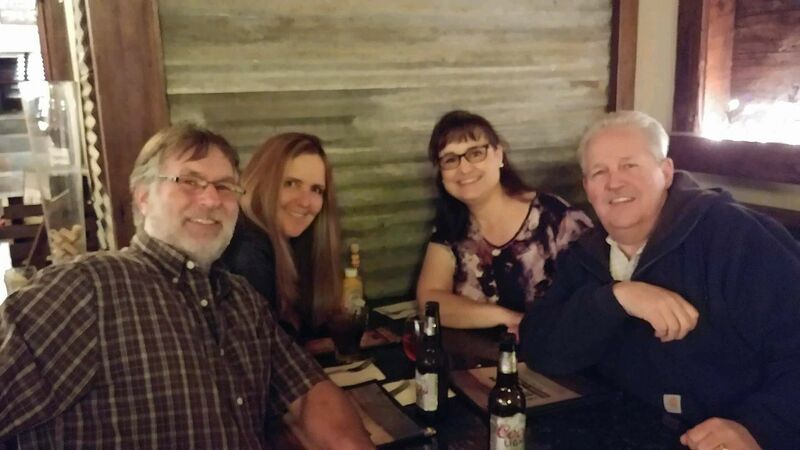 When we were back in Hollister, Kathleen and Ron Manthey took me out for a birthday dinner. We called them later that night and offered to pay half of the bill because we thought they had spent too much money. Ron’s request was that we pay it forward to a War Vet when we came across one in need. So… we paid it forward to George. Doug gave them enough cash to get their own water, gas and food to get them through until their next check arrived. 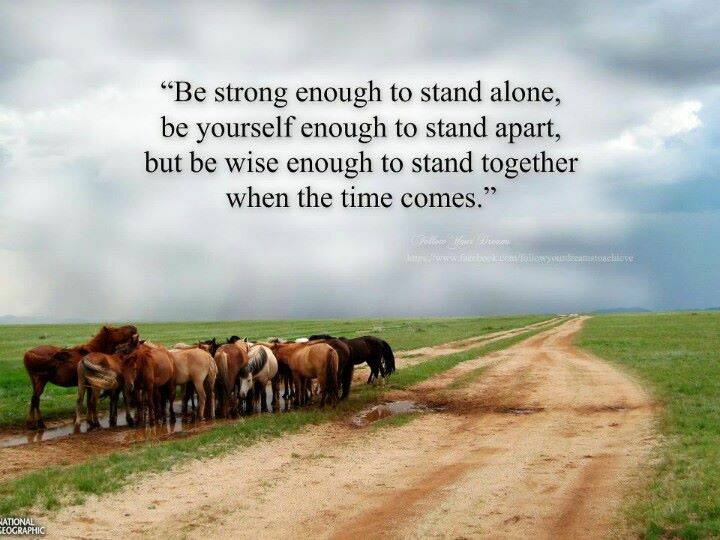 Courtesy of Kathleen and Ron… our dear friends from Face Book. 🙂 Now how cool was that! Everything was cruising along fine, until Andrew came running across the desert with Hercules in his arms. People were yelling that he had been attacked by a huge pit bull when he had gone to get lunch at the church across the street where the War Vet services were set up. We followed Andrew into the church tent while he tried to lay Hercules down and asses the damage. The poor dog was howling in pain. We knew he had to see a vet. When I blurted that out, he said …. “yeah, and who has the money for that.” Without thinking Doug and I said we do. Doug went and emptied the back of the jeep, and we filled it with blankets and cushions so that Andrew could ride in the back with him and support him from moving around while he drove towards a vet that took walk ins by the Mexico Boarder somewhere. I was freaked! Everything happened so fast, and as Doug drove away, I was standing in the desert staring at the road not knowing what to do. I knew he would be hours before he returned. He had taken my phone so I was there alone with Chicago and no contact with the outside world. I was also worried sick about Hercules. 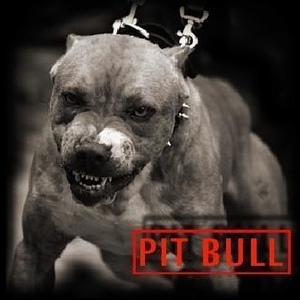 Apparently a huge pit bull latched onto Hercules, and when Andrew attempted to lift him in the air and pull him away from the dog, he latched onto Hercules’ leg and violently shook him in an attempt to rip him apart. People who saw it were of the same mind. That dog needed to be shot. Before anyone could get to the owner after getting Hercules out of there, the guy jumped in his car and disappeared. Now don’t get me wrong, I have had nothing but good experiences with Pitty’s. My dogs have played with then all their lives and we have never had an issue. Down here though the owners breed them for fighting or make them that way on purpose. I don’t know if that dog could ever be rehabilitated, but if it were mine I would have it put down. Sorry. I have to trust my dogs 100% ! And as far as that goes, the owner needed to be hog tied and thrown in jail! Oh I was so mad! Then my mind darted to the expenses. He would need emergency care, x rays and medication if not a cast or surgery if his leg was broken. Long story short. Doug got home safe well after Dark. The leg was not broken, thank the good Lord. He did have puncture wounds that required medication and would have to return to the vet in ten days after the swelling came down to see if the ligaments were torn or ruptured. We dug out Chicago’s crate and Andrew set up house with the boys in the trailer behind the church because there was no way Hercules could get up the stairs going into the unit Andrew called home. What a night. I was just to thankful that Hercules didn’t have more damage to his leg, and that Doug had made it home. Connie sat with me for hours as I stared off down the road. She helped me to calm down because I was so angry that anyone would own a dog they knew would kill anything that came near it, and I was worried about Doug and being alone in the dark when the sun set. For the first time…. I gave and encourage Chicago to bark! Once she knew she was not going to get into any trouble for yanking at the end of her rope with teeth bared and a deep vicious growl, I felt safer. No one came near us. As a mater of fact, George made his way over to tell us he would be keeping an eye on me till Doug returned, but with the racket Chicago was making, I really didn’t have anything to fear. 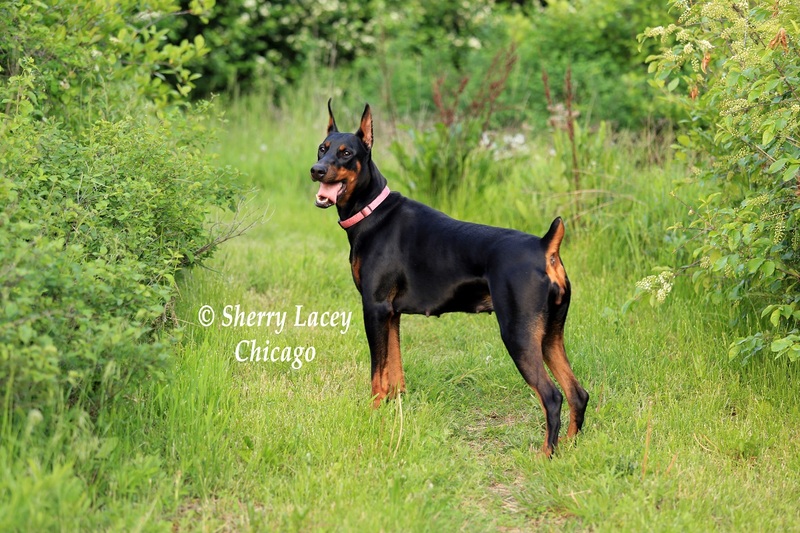 A lot of people out there are not afraid of pit bulls, but we learned that they have a deep seeded fear of Dobermans! Yeah Chicago! Bark your brains out! You KNOW my experience with pits. Poor Hercules and you GO CHICAGO!!! Yes Bonnie….Hercules was one hurting unit. glad we were able to get him to a vet to make sure there were no breaks and get the medication he needs. We have promised to returning ten days so the vet can check him again after the swelling has gone down to make sure there is no further damage… I am changing my mind about Pits with every event we encounter. Yes there are good ones out there.. we know several… but since hitting California… I wouldn’t trust one for a second…. When you have been through and seen the attacks…… it changes your perspective a bit.